Supreme Court Rules Frozen Iranian Money Be Turned Over To U.S. Terrorism Victims : The Two-Way At issue was whether Congress was stepping on the toes of the judiciary by essentially awarding damages to plaintiffs in certain cases. 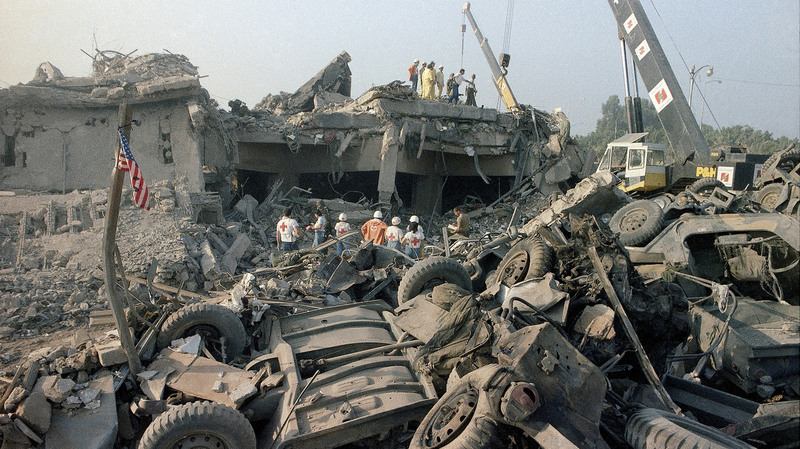 Rescuers search through the rubble of the U.S. Marine barracks Oct. 23, 1983, in Beirut after a suicide truck bombing. The blast — the single deadliest attack on U.S. forces abroad since World War II — killed 241 American service members. The Supreme Court decided Congress can pass a law compensating the victims, and those of other attacks, using Iranian government funds. The Supreme Court handed Iran's central bank a loss on Wednesday, saying Congress acted constitutionally when it passed a law saying nearly $2 billion in frozen Iranian funds should be turned over to Americans who U.S. courts had found were victims of Iranian terrorist attacks. The issue here was not whether Iran should pay; instead it was whether Congress had infringed upon the territory of the judiciary by essentially awarding damages. "In 2012, President Obama froze nearly $2 billion the Iranian central bank had concealed illegally in an account in New York. Congress then amended an existing anti-terrorism law to strengthen it. The new law specified those funds were to be used to pay off the court judgments that found Iran responsible for 19 separate terrorist attacks against Americans around the world." Writing for a 6-2 majority, Justice Ruth Bader Ginsburg said that historically Congress and the executive branch have been given wide latitude on issues of foreign policy, and this is no different. "By altering the law governing the attachment of particular property belonging to Iran, Congress acted comfortably within the political branches' authority over foreign sovereign immunity and foreign-state assets," Ginsburg wrote. Chief Justice John Roberts, a conservative, and Justice Sonia Sotomayor, a liberal, dissented. Writing for the two, the chief justice accused Congress of "commandeering the courts to make a political judgment look like a judicial one." The Constitution, he said, "commits the power to decide cases to the Judiciary alone. Yet in this case, Congress arrogated that power to itself," tailoring the law to make sure that one side would win. Lawyers for the plaintiffs said Wednesday that they would immediately ask a federal judge to authorize distribution of the money. The Supreme Court's decision "will bring long-overdue relief to more than 1,000 victims of Iranian terrorism and their families, many of whom have waited decades for redress," said Ted Olson, a lawyer for the victims whose own wife was killed on Sept. 11. Olson said that arrangements for how the money would be allocated had been agreed on prior to the Supreme Court's ruling.